For the provision of services for water-jet cutting of sheet materials a Roden Company created the largest Ukrainian Center of Waterjet Cutting on the basis of 3 hydroabrasive complexes produced by our company. The presence of such a powerful fleet of equipment allows us to guarantee our customers the terms and quality of execution of orders, and 14 years experience of our programmers and engravers - to optimize the cutting process. Our company also has its own room and storage area in Cherkasy, that distinguishes it among other waterjet centers as it allows to store in its territory large amounts of the customer’s material. It is impossible not to mention the favorable geographical position of our company in the center of Ukraine. Over 14 years of existence, our company has established a clear logistic policy, making our services accessible to all our customers from different cities of our country - from Dnepropetrovsk, Lugansk, Donetsk, Kharkiv and Odessa to Lviv, Uzhgorod, Lutsk and Ternopil. There is a completely transparent pricing scheme for our customers, besides there is a flexible system of discounts, which takes into account all the factors from the total amount of the order to the bonus discounts for single orders for long-term partners. 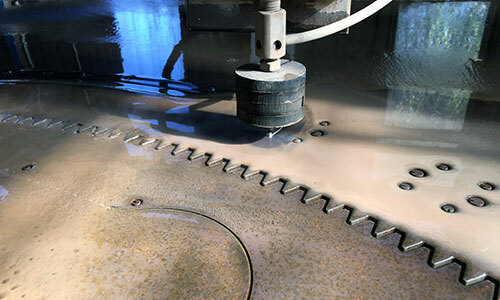 With our equipment, and trained personnel, you can quickly and accurately cut out almost any sheet materials: plywood and foam rubber, plastics and rubber, glass, mirror, ceramic granite and ceramic tiles, granite, marble, concrete and reinforced concrete, all kinds of polymeric materials including composite, metallic foil and plastics, all kinds of non-ferrous metals and alloys, including difficult worked up stainless steel and superalloys, and hard titanium alloys.